Reliance Communications, India’s single largest Dual Technology Service Brand and CDMA major today announced the launch of India’s first Android powered CDMA handset Samsung Galaxy i899 at Rs.19900. 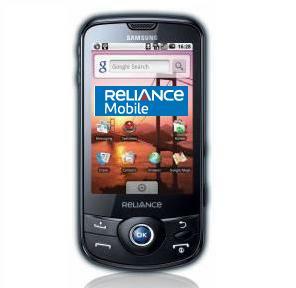 The new Smartphone available only on Reliance Mobile network will also be the first CDMA device to be launched in India pre-installed with Android Market – an online applications store developed by Google for Android devices.Samsung Galaxy i899 will offer an enhanced experience of seamless Speed Data on the Move offering speeds upto 3.1 Mbps to Reliance Mobile customers. The futuristic touch-screen CDMA smartphone would also enable high-speed access to popular social networking sites like Facebook, Orkut, MySpace, YouTube as well as Gmail, GTalk and Google Maps. Featuring a 3.2” AMOLED touch-screen, a 3.2 megapixel camera, a media player and expandable memory upto 32GB, Samsung Galaxy i899 comes with popular Smartphone features including support for phone, email, text messaging, Wi-Fi, HTML web browser and more. Reliance Mobile customers upgrading to Samsung Galaxy i899 will also get Free Data Usage on Reliance Netconnect Broadband+ – 10GB for 1 month for prepaid customers and 15 GB per month for 2 months for post paid subscribers. The smartphone features built-in Wireless Broadband support that offers data speed of upto 3.1 Mbps allowing customers to access Android Market to browse and download thousands of exclusive, free and powerful third-party applications on this platform. The vast reach of Reliance Mobile’s CDMA will allow the Smartphone user to access high speed internet connection anytime, anywhere. “The launch of Samsung Galaxy i899, Smart Phone, is in line with our strategy to offer next-generation services with unmatched voice clarity, hi-speed wireless data network access and ultra-fast application downloads on India’s largest and only nationwide CDMA mobile service to Reliance Mobile customer,s” said Vrajesh Shelat, Head of Handset & Data Services, Reliance Communications. I am not get this (samsung i899) in hyderabad.